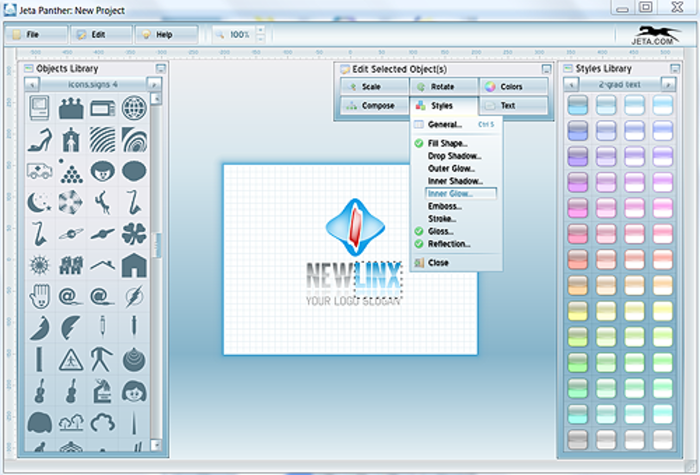 It's simple, fast and powerful software for logo design, icons, business web graphics. Jeta has huge library of over 5000 vector shapes and icons, 200 shape styles and 400+ logo templates, which makes it use even simpler and faster. All logo templates are scalable vector layers, grouped for simple manipulations (can be ungrouped for farther modification). Start your logo design with one of over 400 templates, modify it by replacing shapes and styles and you will get unique logo design in just a few simple steps!